Guest Blog by Jean Azar-Tanguay. Jean is a senior in high school at Boston Latin School. She has been a member of the COLAGE Youth Action Board since 2012 and has attended Family Equality Council’s annual Family Week since she was a baby. She lives in Boston MA with her two dads and brother. On the night of January 24th, my plane touched down in Detroit, Michigan. 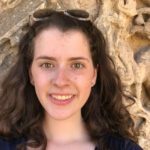 I had traveled from Boston to attend the Creating Change conference for the first time! I did not know much of what to expect but knew it would be a great experience. Friday morning, we woke up bright and early to grab breakfast, because we were leading a workshop at 9am! I have spent the last few months on conference calls with Kaley, Director of COLAGE Programming, and Emily, Director of Family Engagement, perfecting our slides on how to make schools more supportive for LGBTQ+ families. We wanted to show people that there are simple and easy ways to make classrooms more accessible to families like ours. This was the first time that I have ever been a co-facilitator for a workshop, so it goes without saying that I was a bit nervous, but knew that it would be with a group of people who cared about learning from us. Our workshop room was a little tucked away but on the main floor off of a giant circle around the elevators that could take you all the way up to the over 60 guest room floors of the giant hotel. I walked into a room with about 10 people seated, but that number quickly grew to over 30 by time 9am rolled around. Then it was go time. Our presentation went smoothly, we had a lot of really great questions that gave me some hope. 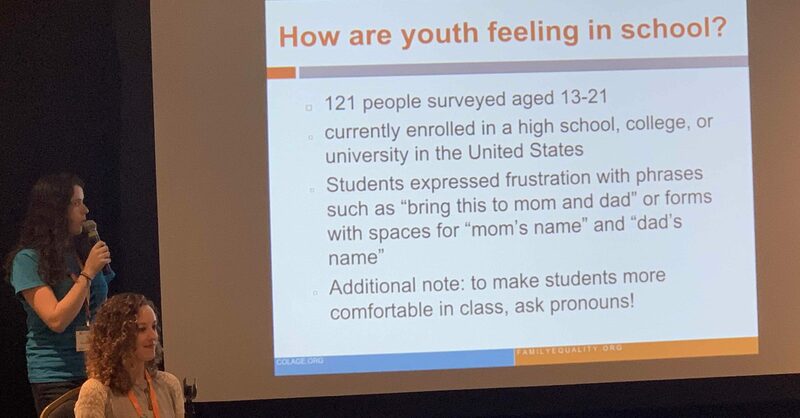 We ran breakout role playing sessions, where people who identified certain ways were grouped together and given a scenario to discuss involving an LGBTQ+ family situation in school. I sat with another person who has LGBTQ+ parents, and he and I discussed a scenario where a classmate notices you do not have a mother, and apologizes for your loss, something that has happened to me in class before. He and I also talked about how our school lives have changed as we have gotten older in regards to our family. After our workshop, I got to attend a couple more on my own time and I selected one on microaggressions, mainly because I knew a week later I would be speaking in front of 160 peers about microaggressions and wanted to have a new take on them going into that. The workshop was interesting and brought up a lot of debate within the community, showing me that it is a complicated topic and everyone has their own take on them. I kind of knew that, but this reinforced it. I also got to attend another workshop on establishing LGBTQ+ family groups, led by a few more people from FEC and COLAGE, which was interesting for me as a youth because I got to see the thought process behind adults when it comes to giving us, their children, a space to be with other families like ours. Seeing how much they actually care about giving us that space was eye opening and made me appreciate LGBTQ+ parents even more. We ended the day with a queerspawn caucus and a group dinner. That was my favorite part of my day because I got to see a lot of people who I typically see only once a year, and in a more formal setting. Getting to be in a queerspawn only space outside of family week set me on the right path for the rest of my week. Those spaces are incredibly refreshing and I always leave them with more confidence in myself. Overall, getting to attend Creating Change was something I will not regret doing. I am already planning my trip to go back next year because the never-ending list of workshops made it impossible for me to hit every session I wanted to. The mindset of everyone at the conference was incredibly positive and I felt welcome any and everywhere in the hotel, regardless of what group I was with or where my identity fell. Being a queerspawn and being there showed a lot of the attendees that we exist and that we are fine. I left for Boston feeling like I have a new community to fall back on, and was given a bit of hope because even in our current political climate, there was a space where people could be together and not be judged on any aspect of their identity. Thank you again to COLAGE and FEC for giving me the opportunity to get involved with such an amazing conference!